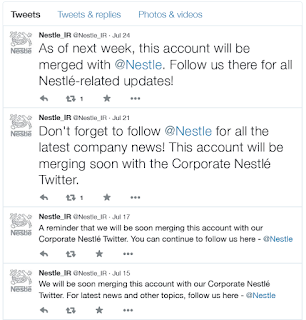 Nestle Ends IR Twitter Account – Report Card on: IR Social Media or Nestle’s Strategy & Effort? 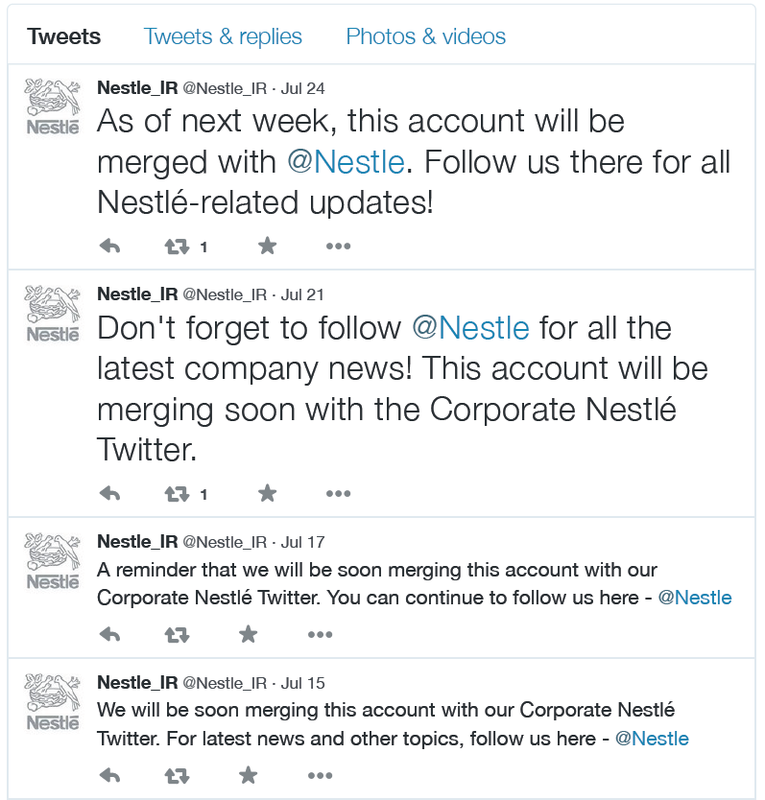 Nestle has announced they are shutting down their @Nestle_IR Twitter account and merging it with their far more robust @Nestle Corporate presence. Insufficient ROI seems to be the reason, so we are ruminating on what this means for IR social media in general? The big question for the ROI of social media in investor relations relates to your strategy and your goals and the relative name recognition (market cap) of your company to begin with. We are proponents of social media to help small cap companies get their stories in front of new investors and customers “for the first time” – a process that seems increasingly challenged – but for global brands like Nestle, we have a harder time justifying the added investment when you already have broad awareness and a robust IR communications effort. But in this medium, we believe your message does matter – so the caliber of your content and the extent to which it delivers on your IR social media strategy is the important question for the evaluation of a program. What’s hard to know from looking at Nestle’s IR Social Media content is what goal did they have in initiating Nestle IR content in the first place? Their effort looks like a tepid toe in the water. From that point of view, the lack of success they ascribe to the initiative by its merger is not hard to understand. However, in fairness, Nestle’s shares do trade in ADR form on the OTC Pink market, which likely makes them less visible or attractive to U.S. investors and those engaged in social media. The Catalyst view is that Social Media for IR is designed to help put your Company story and IR content in front of new investors for the first time – or to remind those who are not actively following you to take another look. It is a way to get further mileage and value from your substantial investment in IR disclosure documents – releases, filings, & presentations. To achieve this goal your messages must be optimized to attract new eyeballs rather than merely provide another forum to reach investors already paying attention. Twitter messages get optimized by ensuring that the 140 character message will be meaningful to as many people as possible. In the IR context, the stock symbol(s) are properly referenced in each message and one should make sure to us subject/industry codes or hashtags (#), key words, photos and video and peer group stock symbols to get your content in front of “new eyeballs” those who are searching for those issues and companies. 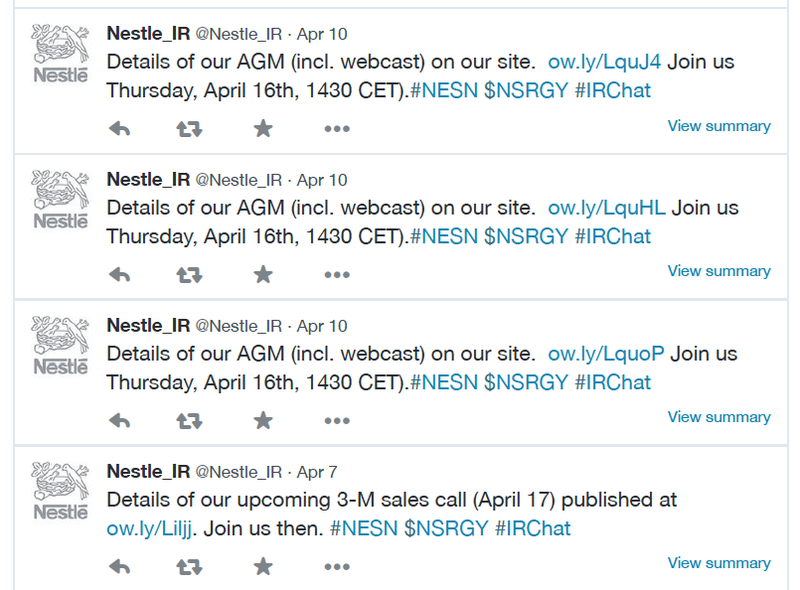 A quick review of @Nestle_IR content today (8/5/15) shows a total of 629 “Tweets” since the start of the account in 2011, with many of the Tweets appearing with identical wording 3-4 times in the same day (but not thereafter), along with little effort to optimize their content for new eyeballs. 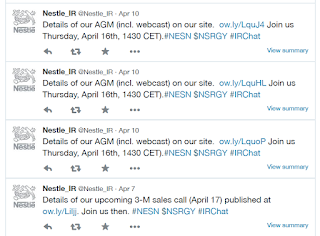 In all, the Nestle_IR Twitter effort seems largely a corporate speak monologue and virtually no character or listening or acknowledgement of others. We found just one retweet in the past year; ironically for an IR Magazine post. more about IR issues than Corp. IR communications – but that’s just us. @Nestle_IR had a modest universe of 934 followers but was following an even smaller number of people – just 61. A quick glance at their tweets showed little or no interaction or “engagement” with the content of other Twitter users, with only one favorited Tweet. We didn’t see any hashtags or efforts to make posts stand on their own or to be optimized for searches. We also inconsistent inclusion of proper references to their stock symbols. In summary, the content is bland and not surprisingly did not attract much of a following, despite the @Nestle corporate account having amassed 110,000 followers and over 4,000 Tweets as of this writing. All of this is to say that Nestle’s seeming disappointment with its IR Twitter experiment should not be viewed as the definitive test of the value of IR social media for all companies, particularly those that are smaller and not as well known. Instead, it seems to be more of a case of tepid social media engagement by a major company with a minor (OTC Pink) equity listing in the US (where I am presuming the largest share of active social media practitioners are located). It just doesn’t seem that the content offered was sufficiently compelling to build engagement and Nestle certainly didn’t extend itself to engage with other participants, further undermined their position, in our opinion. http://www.catalyst-ir.com/wp-content/uploads/2017/05/catalyst-logo-color.png 0 0 Catalyst IR http://www.catalyst-ir.com/wp-content/uploads/2017/05/catalyst-logo-color.png Catalyst IR2015-08-05 18:46:002017-01-23 15:03:21Nestle Ends IR Twitter Account - Report Card on: IR Social Media or Nestle's Strategy & Effort?